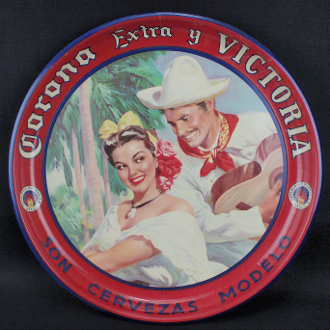 Corona Extra y Victoria Son Cervesos Modelo Beer Tin Tray. Zapata Hermanos Cerveceria Modelo S.A. Mexico. Circa 40-50s. Graphic of a senorita being serinaded by a good looking hombre. Tray is in very good condition. The paint (lithography) is in very good condition. It has some small scratches and stains. Measures 12 3/4" x 1 1/8". Displays beautifully.